The vending machine provides a way to make indirect trade with other players. Using the read administration panel, you are able to create a limited number of Buy/Sell orders for all items and resources, at varying amounts, to do trade. 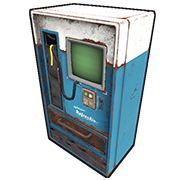 Another player simply walks up to the front of your vending machine, interacts with it, and has a menu listing all of your trades and can make a purchase from there if they have the required materials. Although your resources may be safe from the front, if a raider gains access to the rear panel, they will have free reign over all of your goodies. Keep it safe. Vending Machines do not drop their contents when destroyed. Destroying Vending Machines directly is a bad tactic, instead try to gain access to the room the Vending Machine is standing in and loot the contents via the normal menu. If you're scum and despawn when getting raided you can put all of your valuable loot inside of it and blow it up, alternatively if you do not have explosives you can place it on twig and destroy the twig. You can fit this in triangle room and treat it like a compact Large box. Make sure to turn off its Broadcasting if you use them for storage.